Many researches have highlighted the influence of climate on mortality, showing a high increase in mortality in summer time during “heatwaves”, periods with very high temperature and humidity levels. This relation seems to be stronger than those between mortality and other environmental factors, such as atmospheric pollution.1 According to estimates made in the United States and Greece, unusual heatwaves could cause a 100% increase in daily mortality with respect to the period mean value,2,3 and it might also be speculated that most of such deaths would not have occurred. The greatest effects have been detected in cities with high but episodic peaks of intensly hot weather, such as Chicago, New York, Athens, and Rome. The relevance of such studies is becoming more and more marked as climate change effects are widely investigated. We studied the effect of bioclimatic discomfort on resident mortality rate (for all causes of death) in a fairly wide area (about 200 km × 70 km) in the north east of Italy. The regional population is about 4 million inhabitants. We considered three bioclimatic indices associated with physiological discomfort: daily maximum temperature and Thom index 4 constructed using both average and maximum daily temperature (mean and maximum Thom index). We found a very high correlation between all such indices (Pearson correlation index ranging from 0.91 and 0.99) implying that the precise choice of the index is not critical. The spatial variation of the bioclimatic indeces is fairly low. Pearson correlation indices and regression coefficients among maximum Thom indices in eight meteorological stations distributed with sufficient uniformity in the regional territory range from 0.64 to 0.93 and from 0.92 to 1.13 respectively. All these statistics are highly significant. The average of eight station values in the plain area was considered representative for the entire flat area. Mountain areas were excluded from the analysis. Summer mortality over four years (1995–1998) showed remarkable variations. The year 1997 had the lowest mortality rate, 1998 the highest, 10% higher than 1997. The annual tendency of overall summer mortality as a function of the number of bioclimatically critical days confirms the existence of an association between these two variables and supports the hypothesis that heatwaves could generate additional deaths (table 1). 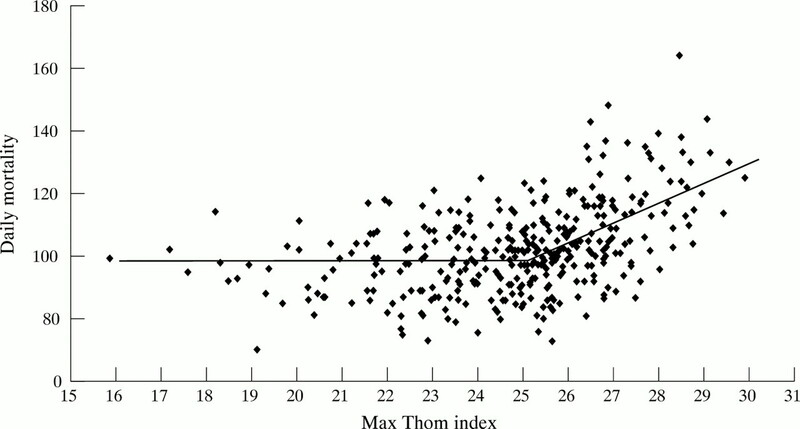 Figure 1 shows the relation between daily mortality and maximum Thom index, which is at first substantially flat and then increases almost linearly. The behaviour is similar for all three bioclimatic indices. In the case of maximum Thom index, the change of behaviour value (threshold value) is about 26; in the case of mean Thom index, the thereshold value is about 24; for maximum temperature it is about 31°C. The average daily mortality before the thresholds is 97; seven are, on average, the additional deaths for each unit increment of maximum Thom index. At present, however, it is quite difficult to identify reliable thresholds because of data dispersion; for the same reasons, it is difficult to establish a linear relation beyond those thresholds. Stronger effects are actually to be expected at very high values of the indices, but episodes of particularly offensive meteorological situations are unusual and longer historical series must be analysed to properly evaluate the effects of such heatwaves. On the other hand, the occurrence of situations with maximum Thom index beyond the threshold is not an altogether rare event: 80 of 368 days considered by the study showed unfavourable bioclimatic conditions. Additionally, the effects of meteorology on mortality assume considerable importance regarding prevention (population alert in connection with forecasting of potentially dangerous episodes) and interpretation of epidemiological surveys on atmospheric polluents. Daily mortality and maximum Thom index. Kalkstein LS. Direct impact in cities. Lancet1993;342:1397–9. Giles BD, Balafoutis CJ. The Greek heat waves of 1987 and 1988. International Journal of Climatology1990;10:505–17. Smith J, Tirpak DA, eds. The potential effects of global climate change on the United States: report to Congress. Washington, DC: Environmental Protection Agency (EPA 230.05–89–050), 1989:172–205. Thom EC. The discomfort index. Weatherwise,1959;12:59–60.